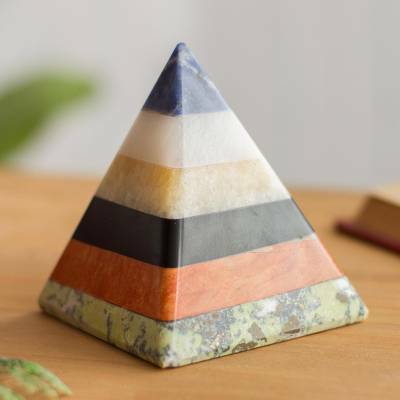 Handcrafted Gemstone Pyramid Paperweight Sculpture, "Natural Energy"
Natural gemstones combine their innate beauty with their mystical energies in a colorful pyramid. Meticulously sculpted by Cesar Gonzáles, it features blue sodalite, white calcite, brown calcite, onyx, jasper and serpentine, displayed from top to bottom. Gonzáles recommends having two or three pyramids oriented toward the north or east near a window, for light. In this way, the earth elements balance the energies in the environment. You can find gemstone pyramid 'Natural Energy' by Cesar Gonzales in sculpture categories such as Geometric Sculpture and Natural Gemstone Sculpture. Enjoy exploring these sections for other Novica treasures. For healing and adding positive energy to your life! Gemstones are said to harbor many hidden properties. "Natural Energy" is pleasing to the eye, as well. It makes a good focus for my quiet times and lends serenity to my surroundings. This made a great gift for my husband. He uses it as a power center in his man cave. Love the pyramids. They feel so good to the touch and are calming to the view. I have "Be Positive" and "Natural Energy". Plan to give them to friends and family too. Beautiful artwork! Perfect for our family members' desk!! She will love it. Such a different item- makes a neat complement to my Egyptian cat. My wife collects pyramids and these blew her away!